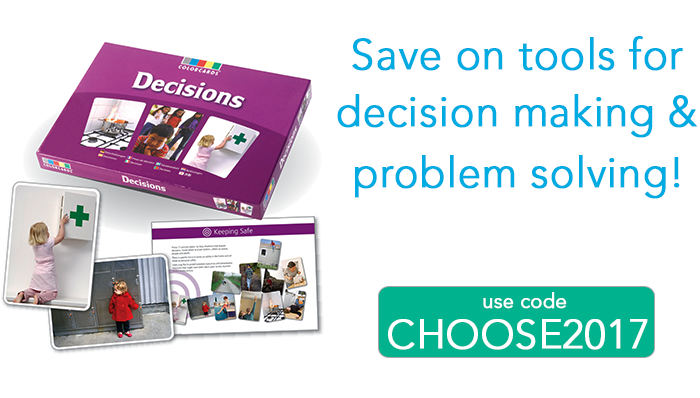 Pick of the Week: Decision Making and Problem Solving Tools! Help young learners sharpen their critical thinking skills! Written by: Different Roads to Learning on June 27, 2017. Last revised by: June 26, 2017. This entry was posted in ABA by Different Roads to Learning. Bookmark the permalink. Our Difflearn blog was created specifically for sharing. Here, we’ll collaborate with trusted professionals and parents to share experiences, concerns, new and exciting products and events and best of all, our collective treasure of information. It is our hope that you will find the information posted here helpful, practical, and interesting and that it will help all of us – especially our children – learn and grow. And this is just the beginning…We hope that professionals and parents who have advice, information or a story to share will contact us and submit thoughts and ideas for blog posts. We intend for this to be a true community and all who are interested in the education of our ASD children are invited to participate.